Our sister company Bluemay Weston manufactures seals and gaskets to customer requirements with expertise extending across the whole range of industrial applications, including the demanding requirements of the medical industry. 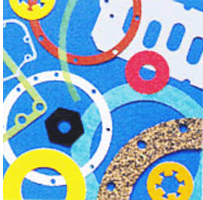 Numerous materials are available for immediate production, including materials for high temperature seals and gaskets. Specialized materials such as RF shielding and reinforced insertion rubbers are ideal for water jet production. In addition many of these materials can have adhesive backing applied prior to manufacture. We are able to offer low tack adhesives for use in positioning components before or during assembly and also high tack adhesives which cure over 24 hours to give a permanent bond.